Acquisition of machine data and production data helps analysing processes and process steps in production: machine running times, downtimes and number of pieces per hour. For this, data must be captured and transferred to superordinate software. The machine running time is an important parameter for ascertaining the machine hour rate that has a direct influence on the production costs and on the product manufacturing costs. If it is reduced, the production costs decrease and thus the product manufacturing costs also do. It gives information about the downtimes of a machine, their cause and meaning: repair, maintenance etc. The stability of processes and the breakdown risk can thus be established. The number of produced pieces shows how good a machine is set up and parameterised and the impact on the productivity. The exact number of good pieces, defective pieces and pieces for rework can be ascertained. With this data the machine can be readjusted for increasing the productivity. 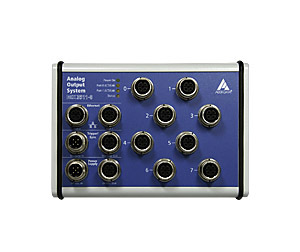 Distributed Ethernet systems by ADDI-DATA allow capturing machine data. The robust compact systems of the MSX-E series can be directly mounted on the machine. They are IP 65 and suitable for an operating temperature from -40° C to +85° C. Sensors can be directly connected to the systems. The acquired data is directly transferred to databases, MES or ERP systems for processing. This is done with the DatabaseConnect software.